The Tory Party has decided to make public finances a key battleground for the election. Key supporters of austerity such as the FT’s economics editor Chris Giles have echoed that, arguing that the “defining battle of the 2015 general election [is] over borrowing and public spending“. It is only possible to stake out political ground on the issue of public finances because of the distortions surrounding them. The level of government debt is rising. This is because the government is adding to its annual levels of debt stock with new public sector deficits. The actual trajectory of government finances, rather than Coalition propaganda, shows that austerity has not led to a significant improvement, certainly nothing like the promise to ‘balance the books’ in this parliament. Government debt and the deficit have both deteriorated under austerity. In addition the data on public finances actually show that the opposite policy works. Investment (albeit in a very distorted form under Osbornomics) leads to economic recovery and improving government finances. This article will deal solely with debt and a further article will deal with the deficit. 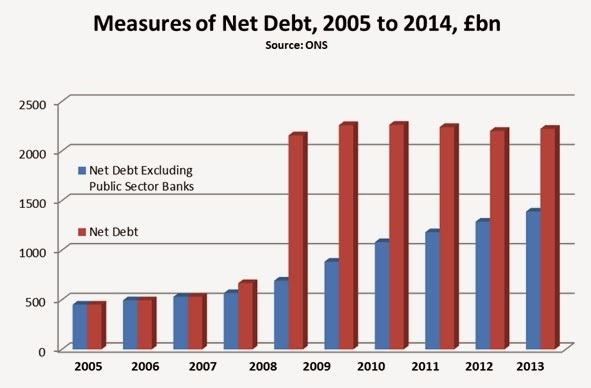 There are two main measures of public sector debt used by the Office for National Statistics (ONS). The first is Net Debt. But this is data which includes the costs of the bank bailouts from 2008 and 2009. Therefore the ONS produces a dataset on Net Debt Excluding Public Sector Banks. This is an underlying measure of debt related to the real economy and government fiscal policy. These two measures have been moving in opposite directions. This is because the amount of debt incurred in the public sector bailout of the failed private banks has been falling. 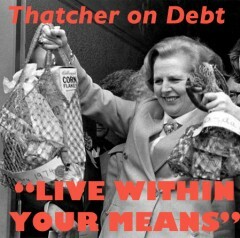 A large proportion of that debt has been repaid by the banks. The two main measures of public sector debt are shown in Fig. 1 below. The last year of the New Labour government in 2009 recorded a level of Net Public Sector Debt Excluding Public Sector Banks (‘Net Debt excluding banks’) of £884bn. The same measure of debt has risen to £1,483bn by end 2014, and will certainly be higher before the Coalition leaves office in May. At the same time the total Net Debt measure has shown a decline from a peak of £2,261bn in 2010 to an estimated £1,795bn at the end of 2014. This is because there has been a repayment of over £1,000bn in the amount borrowed by the public sector to bail out of the banks. The remaining discrepancy between the two main debt measures is the amount still owed by these banks, a total of £308bn. It is highly questionable whether all of these outstanding debts will be repaid and there were certainly better uses for government funds than bailing out failed bank speculation. Even so, the divergence in these two debt measures should highlight two important facts. First, austerity has not led to an improvement in government finances, the underlying level of debt has surged under the Coalition. Secondly, even the investment in failed and corrupt banks, whose managers and traders continue to siphon off huge bonuses, has provided a return to government finances. If the bonuses had been curbed and instructions issued to lend to the most productive sectors of the economy then the return could have been substantially higher. In solely the narrow and false framework of government finances austerity fails to deliver improvement whereas even misdirected investment does. Properly directed pubic investment remains the real alternative to austerity. The data does not support the Tory propaganda on public finances. The debt has soared under austerity. The alternative of state-led investment has been shown to work. Posted in: Conservatives, Economy, Macroeconomics, Politics. needs a public campaign. It is baffling that there is not an Anti -Austerity Alliance. there is an Anti Academy Alliance, for those of us in education.